Cost: $70 early registration by September 30; $85 for late/walk-in registration; or $20 for SCVA collegiate members (includes SCVA Student Membership). Participants do not need to be current SCVA members. Payments can be made using PayPal, check or money order only - no purchase orders. Lunch: A Panera box lunch is included in your registration fee. All box lunches include a sandwich (Ham & Swiss, Turkey, or Mediterranean Veggie), chips, cookie and water. Any registration after October 5 will receive a Turkey sandwich. Break-out Sessions: All Break-out sessions will be by instructional level. 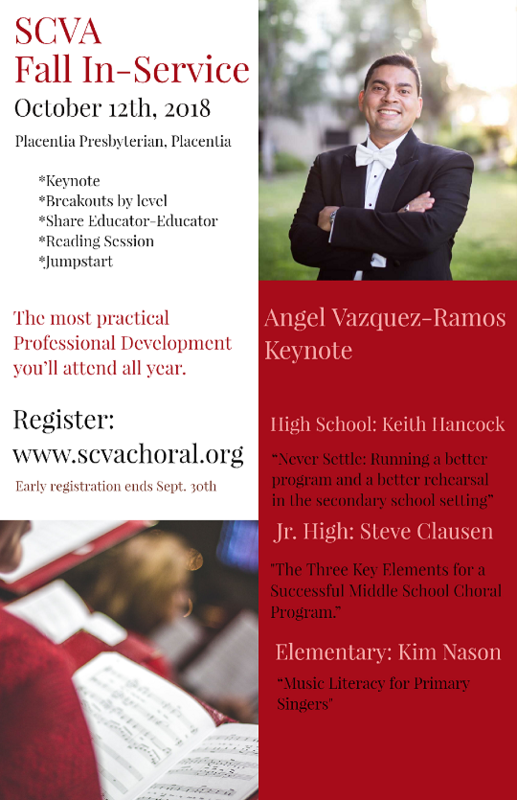 There will be a "Sharing of Best Practices, Educator to Educator" session. If you wish to share, please be prepared to present for 3-5 minutes on a relevant topic of your choice to a small group of people of the same instructional level. Ideas: warm-ups, booster clubs, classroom management, choral tone, literature, choir tour, etc.